4. Diet & Nutritional factors – low vitamin D levels, thyroid dysfunction, low B12 or folate levels. a. Orthopedic and rheumatologic diseases that impair gait. b. Foot and podiatric impairments – Charcot joints, plantar fasciitis, valgus/varus deformities. 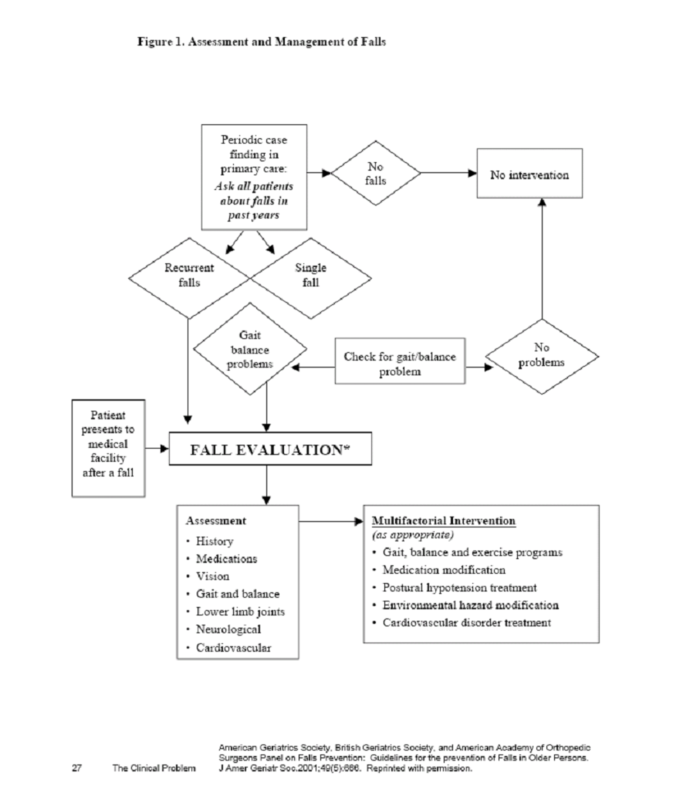 Perform a “falls assessment” to determine possible contributing factors to patient falls. A "fall is defined as an unexpected change in position from one level to another lower level. According to the CDC, 1/3 of adults aged 65 years and older fall annually. Falls are the leading cause of injury in the elderly, with 18,000 older adult deaths due to unintentional fall related injuries yearly. The underlying science will vary based on the etiology of the fall. There are numerous possibilities that may be contributing. EXAMPLES INCLUDE: Diabetic neuropathy – Increased glycosylation of hemoglobin due to increased plasma glucose levels may lead to neuronal cell damage and loss over time. Anticholinergic medications – Inhibition of the cholinergic neurotransmitters in the brain has been shown to predispose patients to falls. List 5 medical assessments/interventions that may be done to further assess potential fall etiologies. Users are free to download and distribute Geriatric Fast Facts for informational, educational, and research purposes only. Citation: Steven Denson, MD, Judi Rehm, Diane W. Braza, MD, Bambi Wessel - Fast Fact #1: Assessment of Fall Risk Etiology. February 2012.